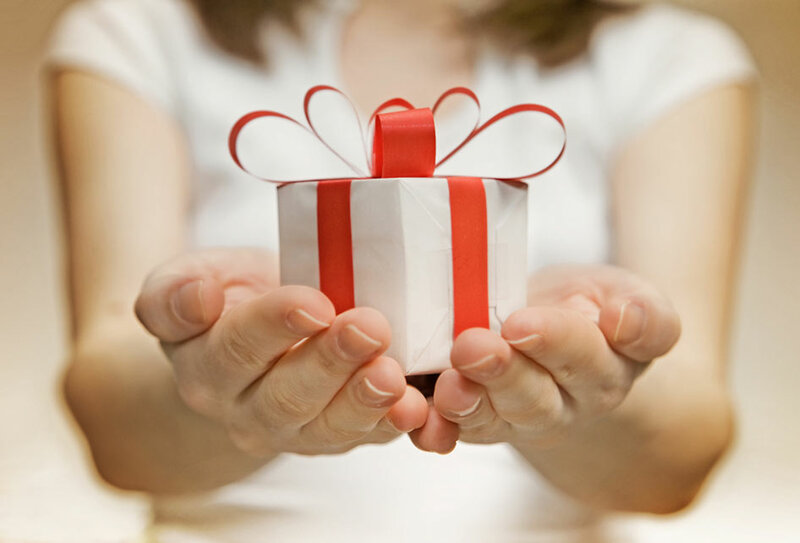 ﻿ The Fine Art of Gift Giving | Christiane Northrup, M.D. It’s been almost ten years since my family updated our gift giving practice. Now our presence is the present we exchange. At the time, my extended family and I were all traveling to Upstate New York to celebrate my mom’s birthday, which is just before Christmas. Because of logistics, we decided to forgo our traditional Christmas gift exchange. Our holidays have been more meaningful ever since. How much is too much? Do you ever ask yourself that question? Sure, we want the holidays to be magical, especially for the young children. But, many of us have too much stuff to begin with, so why is the habit of over-buying and over-indulging so hard to break? There have been many times when I was guilty of going overboard when buying for my daughters. I’m a firm believer in abundance on all levels, but when does abundance become excess? Here’s what I’ve come up with: The giving of a gift and the receiving of a gift should give an equal amount of pleasure. It’s like giving a lover pleasure. You get as much out of the experience whether you’re giving or receiving. Plus gift giving should be meaningful, not stressful. Here are some suggestions to do just that. With a little creativity and thought, the gifts you give can be wonderful, regardless of your budget. Find your personal truth about what is just enough. Giving gifts is like eating chocolate. You need to know when to stop. Who wants to have bills they can’t pay in January because they overspent at the holidays? Sticking with a spending limit doesn’t mean that the value of your gift is diminished. I’ve enjoyed receiving used books and CDs just as much as receiving items that are far more expensive. And fight the urge to break your budget. You’ll be glad you did. Don’t give out of guilt. I realize now that too often my giving came from a place of guilt or obligation, not of genuine joy or a sense of overflowing abundance. When a gift (or anything else) is given from a place of guilt or obligation, it diminishes the gift. It doesn’t carry the same meaning, and it rarely improves your relationship with the person you give the gift to. Gift-giving alternatives. I’ve hosted several parties in which I’ve asked guests to come prepared with a “party piece” of some kind, such as poem, a song, a funny story, a joke, a magic trick, or a dance number. Whatever! After dinner, we’ve sat around and enjoyed ourselves royally, appreciating the talent and humor in the group as we’ve each gone around the room and shared our party piece. Consider a holiday gift fast. Going on a “holiday gift fast” ten years ago helped me to reset my gift-o-meter! What a pleasure to recycle all the catalogs almost as soon as they arrive! I hope we’ll do this again sometime. I would also like to take my family somewhere warm and make that the gift—each other’s presence. Give to others. Many families choose to give to families in need or to gift drives for children who would otherwise have nothing this season. Make someone else’s dreams come true (which I feel is powerful to do anonymously) by making their holidays special. And for the person who has everything, make a donation in their name to a favorite charity. No matter what you decide to do with the giving and receiving of gifts, think of them as tangible forms of energy that can be received, given, and re-gifted. Practice becoming a more conscious vessel for both giving and receiving. This will go a long way toward keeping your life—and your gift giving—balanced. Thanks for this Christiane. I’ve been a fan and reader of yours for many years (you’ve gotten me through some difficult times), and apparently we’re on the same wavelength on this topic. I’ve been thinking hard about the holidays and gift-giving, and recently wrote a blog post about it. It’s probably time for our family to renegotiate the terms of Christmas celebrations, and come up with new traditions. We too travel to upstate NY and forgo gift giving years ago and it has been the best!